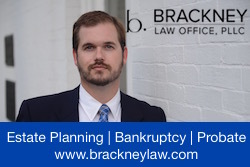 Nota Bene: An article appearing in the Lexington Herald Leader on April 15, 2013 incorrectly identified Peter Brackney as the author of this post; Chris Ertel noticed the classified and experienced this amazing Greek Revival. In March, I noticed a classified ad for the absolute auction of a farm in Mercer County. The photo showed a beautiful Greek Revival Mansion. I saw this as a unique opportunity to experience a seldom seen historic site. I went to the open house the weekend before the auction and found a large throng of curious visitors roaming through the house and grounds. Glenworth was built in 1848 by Robert Mosby Davis on land deeded to him by his uncle, Robert Mosby He was the namesake of his uncle. It was given to him for taking care of his uncle in his old age. The land was originally owned by the Robards family. Lewis Robards married and lived here with Rachel Donelson Robards, later Mrs. Andrew Jackson. 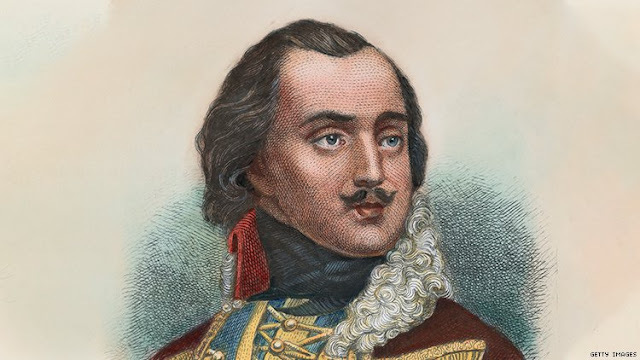 Her father Colonel John Donelson was the founder of Nashville, Tennessee. There was a bigamy scandal when Andrew Jackson married Rachel Donaldson Robards before a divorce was finalized and Andrew Jackson was dogged by political gossip throughout his career. The land passed to Robert Mosby through his marriage to Lewis Robards’ sister. 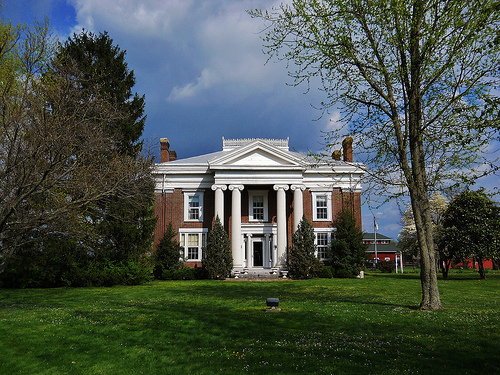 Glenworth is an excellent example of a high-style Kentucky Greek Revival plantation house. 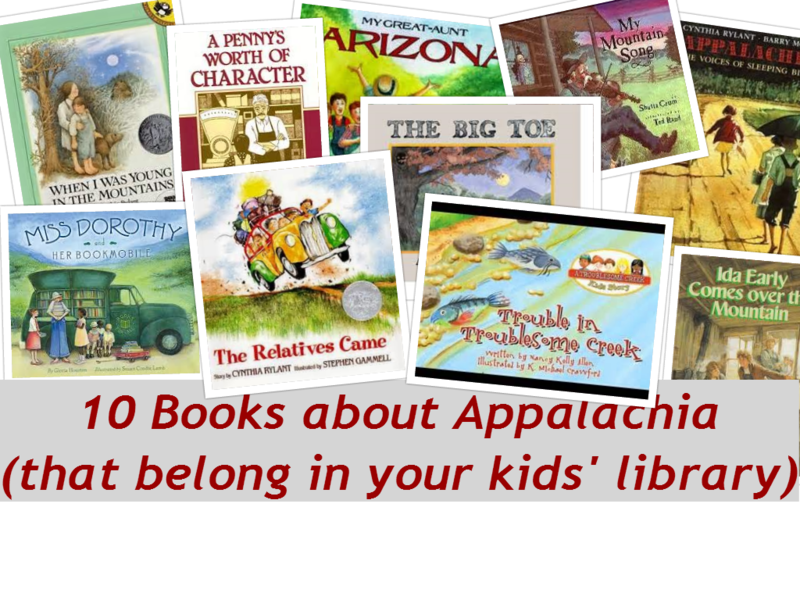 It bears a similarity to Fayette County's Waveland. It is a two story brick house with a full entablature divided into an architrave and frieze. 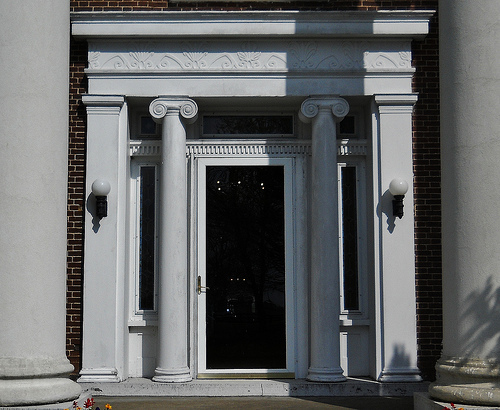 The entablature rests on paired brick pilasters. 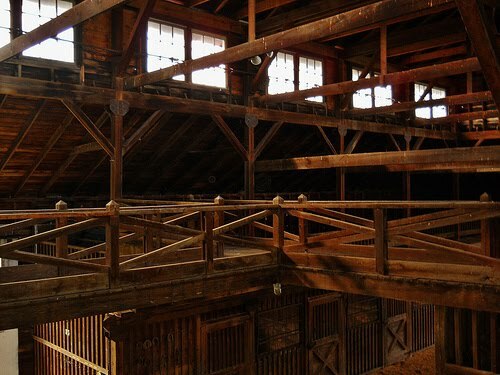 It is surmounted by a hipped roof topped with an observation deck enclosed by a cast iron cresting. Like Waveland, the façade is divided into three parts with each bay being divided by the paired pilasters. 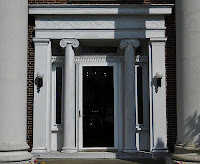 From the four central pilasters projects a pedimented portico with paired Ionic columns. The first floor windows and doorway echo the tripartite theme of the façade with triple windows on each side of the doorway also in three parts. The doorway features Ionic columns in antis between pilasters supporting an entablature, forming sidelights and a triple transom. In the frieze are stylized anthemion decorations. 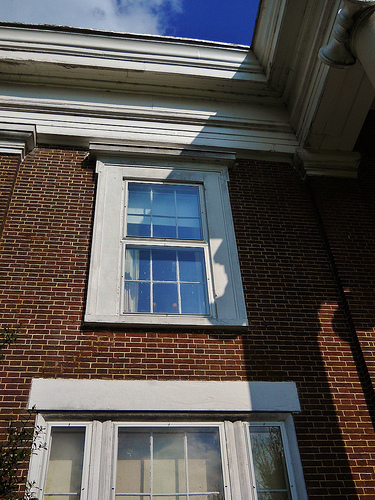 The triple windows have simple lintels over them. 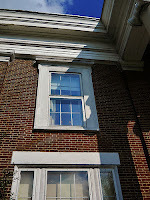 The second floor windows are framed by Greek shouldered architrave moldings crowned by cornices above. This is different from Waveland where all windows on the façade are triple windows. A two story gallery with square brick piers ran along the back of the house with an exterior stair. It was later enclosed. Behind the gallery is a one story brick ell. The ice house, shown in the photograph of the rear of the house, is cylindrical with a conical roof like Ashland and many bluegrass estates. The ice house is one of many original outbuildings at Glenworth. The interior is divided by the central hallway with a pair of rooms on each side. 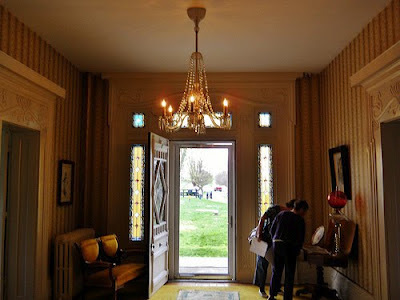 The interior doorways also have anthemion moldings and shouldered architrave moldings. The staircase has a magnificent newel post and ornament from later in the 19th century. An opening with engaged Ionic columns divides the two parlors on the right side of the house. 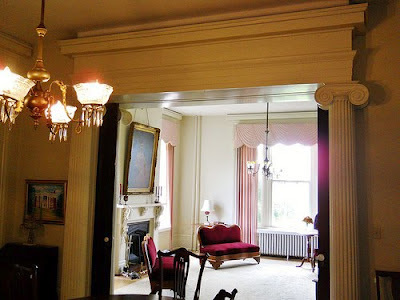 Also visible is the bracketed mantel, more indicative of the style ten years later. 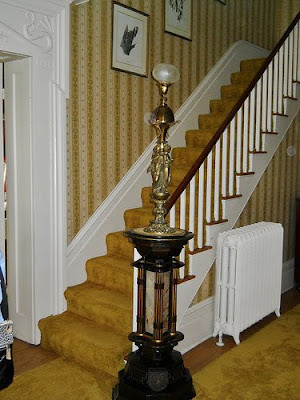 The house had minor updates throughout the remainder of the 19th century. 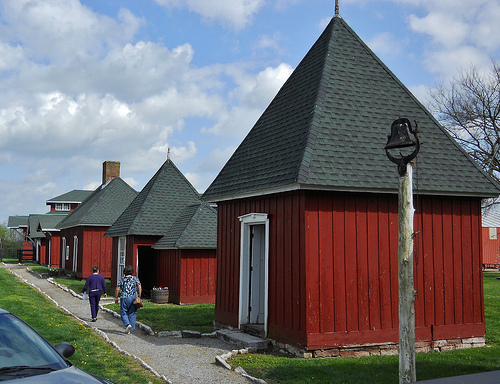 Glenworth has an impressive array of outbuildings. Pictured are an octagonal brick supply house, meat house, frame poultry house, slave quarters. The meat house and slave quarters are of log covered with wood siding. Vertical board and batten construction is used for the wood siding. All the original ones have a hipped roof much steeper than the main house. The last two had gable roofs and probably date to later in the 19th century. The heyday of the property came at the turn of the century when 20 year old Adam S. Edelen from Danville, a graduate of Centre College rented the farm in 1895 and later purchased it in 1905. Glenworth Stock Farm was one of the most prominent Saddlebred farms in Kentucky. It produced many champion show horses including Bohemian King, Bourbon King, Bourbon Chief and Montgomery Chief. The Saddlebred is a breed created in Kentucky as a plantation horse. It was a favored mount in the Civil War. Due to its showy gaits it became a show horse. The Grand Championships are held at the Kentucky State Fair in Louisville. The farm also raised Jersey cattle, English Berkshire swine and Poland-China swine. His wife, Elizabeth Beard Edelen was known for her elegant entertaining at Glenworth. 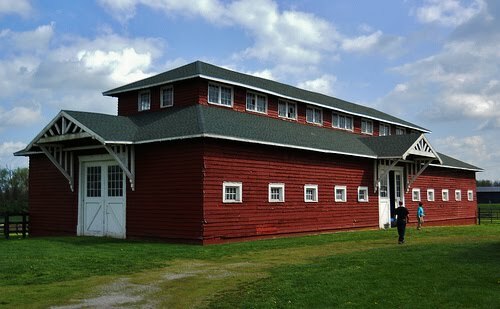 Mr. Edelen built the impressive 18 stall horse barn around 1910 and the farm manager’s house around 1920. 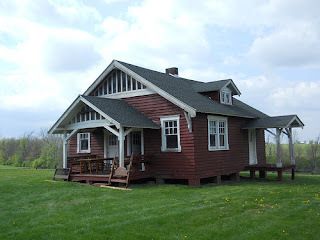 Mr. Edelen sold the farm in 1927. The auction was conducted on March 31, 2012. The house, buildings, and approximately 108 acres sold for $810,000. 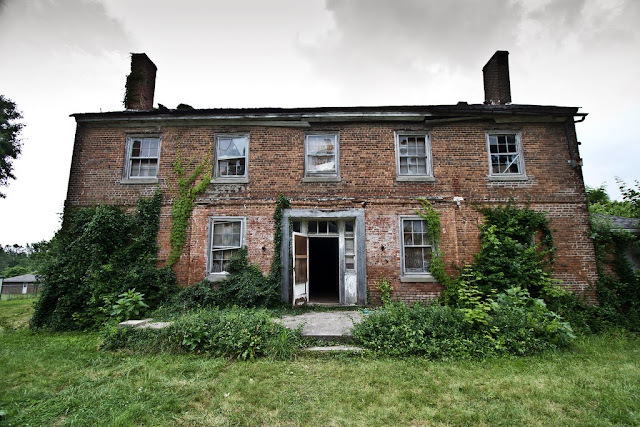 Hopefully, the new owners will preserve the house, farm and outbuildings for future generations to enjoy. Only a few of the many photos of Glenworth can be found on this page. For more photographs of this beautiful Greek Revivial, check out these photographs on flickr.